Gems Of Choral Music: George Friedrich Händel (1685-1759) - Chandos Te Deum (World Premiere Recording)/Chandos Anthem "Let God Arise"
George Friedrich Händel (1685-1759) - Chandos Te Deum (World Premiere Recording)/Chandos Anthem "Let God Arise"
When Georg Friedrich Händel was born in Halle on 23 February 1685, the same year as Bach and Scarlatti, Europe was largely a geographic term, and one could hardly speak of a feeling of supranational unity. Händel was one of the few who represented a cosmopolitan form of musical artistry. He was, of course, shaped - albeit in varying intensity - by the music centres of Europe. Italy provided him with a variety of forms and the technique of musical diction, while France's influence centered around the stylistic peculiarities of overtures, suites and opera compositions. England - his residence of choice - provided the artistic foundation for his oratories, with which he set new standards in the history of music composition. When Händel settled in the English capital in 1717, after George I was named king, he not only encountered a myriad of possibilities for the development of his music but also forward-looking intellectual stimulation. Thus he came to know John Locke and his empirical-rationalistic philosophy, and he also met numerous librettists for his oratories. Händel did not turn to the oratory until after he completed his extensive opera oeuvre. To date Händel owes his fame to his oratories, which clearly show in their scenic conception that throughout his life the theatre was the focal point of his artistic inspiration. The unmistakable style of his vocal and vocal-instrumental work was made possible by the existence of large choirs in England that had been established by the musical culture of the rising middle class. When Händel entered the service of the Duke of Chandos in Cannons, he was primarily involved in composing anthems - church music compositions with English texts that were not part of the liturgy. 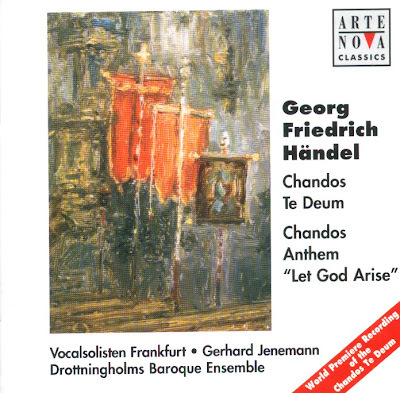 At this time Händel composed Chandos Te Deum HWV 281, commissioned by the Duke, as well as the Chandos anthem "Let God Arise" HWV 256a. Both compositions rely on older instrumental and vocal works by Händel and are characterized by the most varied harmonic figures and contrasts in tone. The cantata-like arrangement of the verses is achieved by alternating transparent counterpoint in the choirs with airs and accompagnatos in the solo parts, which in stylistic terms is also reminiscent of the cantata form. The CD was released by Arte Nova, 1998 (DDD). Arte Nova 74321 59228 2.